Usually, for a book of short stories, I rate each one individually, and then calculate the average when I'm done. After I gave the first few stories 4.5/5 stars, I didn't bother with the rest. I thought this was a great book about people dealing with life and the sometimes difficult situations it deals us, while we try to navigate our way through them hindered by our own inherent flaws. The book deals with the everyday complexities of life, and focuses as much on our inner struggles, as on the outer ones. The way we see ourselves, they way other see us, the way we interact with those around us and the consequences of the decisions we make, while we continually hope to learn from life (with moderate success at best) before it passes us by (which it inevitably does). I really liked this book, and would easily put it on par with Alice Munro. 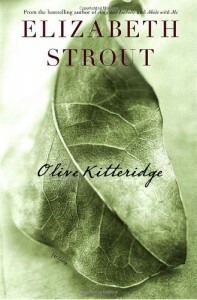 I liked the way Olive Kitteridge was involved in each story, sometimes with just a minor mention. Also, for some reason, I kept getting the feeling that Olive was the female version of Updike's Rabbit, which made me smile each time the thought popped in my head.